Heat oven to 375°F. In 10-inch skillet, melt 1 tablespoon of the butter over medium-high heat. Add onion and bell pepper; cook and stir until tender. 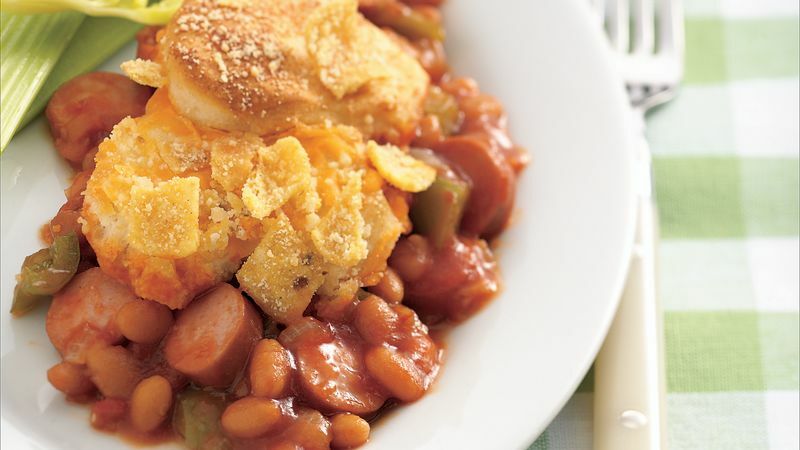 Add hot dogs, chili sauce, ketchup, brown sugar and beans; stir gently to mix. Reduce heat; simmer 2 minutes. Spoon hot mixture into ungreased 11x7- or 12x8-inch (2-quart) glass baking dish. Separate dough into 10 biscuits. Separate each biscuit into 2 layers. Arrange 10 biscuit layers over hot beef mixture. Sprinkle with Cheddar cheese. Arrange remaining biscuit layers on top to cover. In small bowl, mix corn chips and Romano cheese. Sprinkle over biscuits. Dot with remaining tablespoon butter.